But I can't trace time. I spend a lot of time in front of a computer screen and run across some pretty useful (and some useless) information on the Internet. One day I read a ‘tweet’ talking about a project called ‘Knit-a-Year’. I was intrigued. The instructions were easy; cast on some stitches, knit at least two rows every day using a color that fits your mood or feelings that day. You could journal or blog, as a kind of documentation of your feelings. I chose to blog. When I told people about the project, more often than not I got a blank stare. Why would you want to do that? What is it for? What are you going to do with it? There were a few who thought that it was a fun, interesting and even cool idea. I guess, on the whole, it’s a little ‘out there‘ for the average person, especially if the person doesn’t knit or worse, isn’t creative. I started on April 1, 2010. I finished on March 31, 2011. I made it through the whole year! As I look back on the year I ask myself some questions. Why did I do it? Why did I stick with it? Why did I bother to finish? What did I learn? What now? I chose to participate in this project because I thought it sounded interesting. As is often sometimes the case, I didn’t follow the instructions exactly. I can call it creative license. Yeah, that sounds good. Instead of one long continuous strip, I chose to break mine into ‘seasons’. I have four strips, one for spring, April through June, summer, July through September, fall, October through December, and winter, January through March. It doesn’t quiet go along with the seasons but it’s close. The stitch the original project called for curls in on itself. The result would be a very long skinny tube. That didn’t appeal to me at the time so I made mine wider and chose a stitch that would create a flat fabric. I never found this project to be a chore. 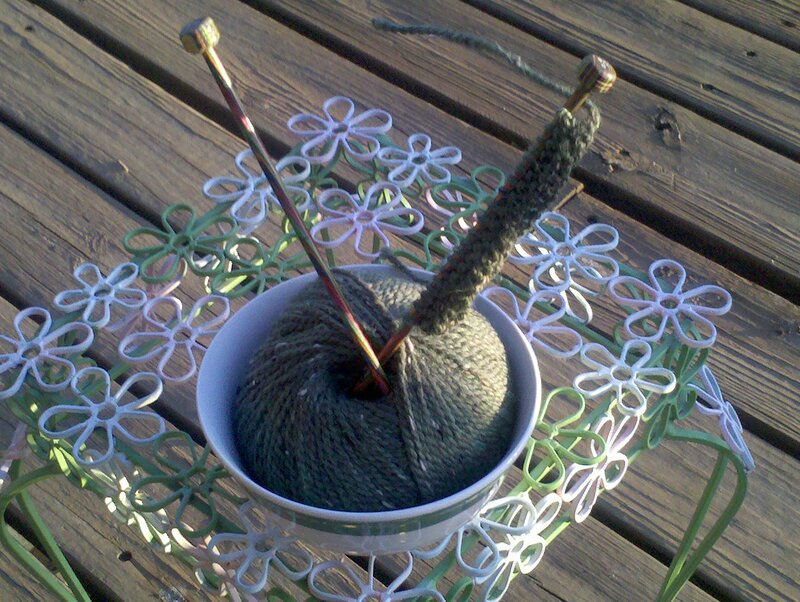 At first I made it a point, no matter what, to knit on it each day. But I travel for my job and carrying a bunch of different yarn with me didn’t work. I wanted to stay with the spirit of the project and choose something that portrayed my mood at that time. So I couldn’t pack some red, yellow, green, etc., because I might not have felt red, yellow or green during the time I was gone. Instead I would record how I felt then pick the yarn when I got home. If I did have a color in mind I’d make a note of it as well. I would usually knit when I was alone, at night after everyone went to bed. It was a peaceful time and I could think (or worry) about whatever crossed my mind. Perhaps the hardest thing was to find the yarn I wanted to use. I have quite a bit of yarn. Probably too much, depending on who you ask! At the house we did some rearranging and I got some cabinets to store all the yarn in. To get it from the upstairs room to the downstairs room required putting it in boxes, bags, or whatever was available. Some of it is unpacked but quite a lot isn’t. I’d want a certain yarn and wouldn’t know where it had been packed. That frustrated me. In the beginning I decided I was not going to duplicate the yarn used. I could have done that easily. But the packing and not being able to find things plus trying to keep up with what had been used changed my mind. Instead I made sure that each strip never had repeats of the same yarn. The journaling was optional. At first I went into a lot of detail about why I chose the yarn for that day, what it was, and why. Later I cut some of the detail. I decided to write a blog and as I wrote sometimes I wrote too much before I even got to the knitayear. That part was for me anyway. I didn’t figure too many people really cared why I chose purple boucle or not! I did find out I enjoyed the writing and will continue to blog. Here are some interesting observations I made during the year and after completing the strips. • The first strip is the longest but the last strip is not the shortest. The shortest one would be ‘fall’, with Thanksgiving and Christmas included. I think it was a time thing and I just didn’t add as much on each day because there were a lot of other things going on. • I tend to be influenced by the color of the season. The fall strip, especially at the beginning had a lot of oranges and browns. There’s a block that’s got a lot of red and green and white in it. The spring strip had a lot of bright colors, cheerful, which reminded me of spring. • The same color didn’t mean the same mood. For instance there were times I used blue when I was happy and times when I was sad. For the most part though, if it was really a bad day there’s probably some really dark yarn, like black or brown included. I couldn’t really determine a ‘happy’ color except that it was bright. • I like variegated yarn. That means it’s one strand with different colors. I can’t help it. When I look at yarn those jump out at me. I think maybe it’s to do with holding my attention. When the colors change it keeps things interesting. • I like bright colors. It doesn’t seem to be a particular bright color because I have a lot of all of them except possibly yellow. My mother always told my sister and I we couldn’t wear yellow so I shy away from it. Turns out it was her who didn’t like and couldn’t wear yellow but I was already conditioned! • I like texture. I have a lot of novelty yarn, fun furs and the like left over from the scarf rage a few years ago. But I also have a lot of ribbon, thick and thin and boucle yarns. • I don’t make socks but I like sock yarn. There are beautiful colors in sock yarn. The knitayear didn’t always capture the changing colors because it was such a short section of knitting. • Looking back, if I had left the strip as a tube I could have wound it into some kind of rug. Oh well. Overall I’m glad I participated and after thousands of stitches I’m pleased I completed this project. I got personal satisfaction from it. I know for sure that I can stick to something and get it done, especially if it is important to me. I enjoyed the time I had to set aside to think about the day. I might even do it again, or something similar anyway. If I do I’ll plan a bit more. Maybe make something specific that was big and would take a lot of time. At one time there was talk by the originator of the project, of an international display of some sort. If that comes about I will take part. I’m still not sure what I’ll do with the strips. I could use the strips around the top of the wall as a border or just hang them on the wall as some kind of weird art. Or I might just put them in a box and stick it somewhere so it can be thrown out when I die! I could sew them together and put them across the bottom of the king size bed like hotels do with that little piece of cloth. I’m not sure how well that would go over! I’ll just hang on to them until I decide. Color is an important part of our lives. What we choose is not random, even though putting it all together, side by side every day looks abstract. Color holds individual meaning to us. The colors we choose give personal insight about what is going on inside, our innermost feelings and emotions. That’s really what the knitayear was about. Knitting was just the way I chose to express it. And my time was running wild. Every time I thought I'd got it made. So I turned myself to face me. Of how the others must see the faker. I'm much too fast to take that test. I think it was such a neat project and am proud that you were able to complete the whole thing! I feel like I can never commit to something for that long! Don't you DARE stick them in a box! I love the idea of putting them on a comforter. You could whip up a few extra pieces and make matching shams. Or, I don't know if you would want to cut any of them, but I bet it would be pretty if you got a piece matted and framed it. You could do different sizes in different sized frames. I think it's great that you stuck with it for a whole year. That's a long time to be faithful to a project! I'm looking forward to seeing what you do with all the strips now, they're huge! I enjoy your blog so much! And I always read the part about the Knitayear! I'm proud & a little amazed that you did it. I was too hard for me. You are persistent but I bet you already knew that. Funny thing about your mom & the yellow....My mom's favorite color was yellow & I just realized the other day that I've always said yellow was my favorite color only because it was my moms. I'm 55 years old & just now growing up! OY! I like green. I have loved stalking...I mean following you and your knitayear. Wow! I think it is an accomplishment and filled with meaning. I love the pic where you have it hanging on the side of the house. Since I am a lyrics nut I have so enjoyed all your musical excerpts. Rock on friend! Oh...my mother told me the same about yellow...turns out she hates it because she got in a wreck in a yellow car. Yup...she is super superstitious. Congratulations for finishing your Knit a Year! I think you should find some way to display the project. I love that you stuck with! And your strips of color and texture are marvelous! Thanks everyone, for the comments on the knitayear. It was fun. I'll let you know what I do with the strips...when I decide! So glad that you made it to the end and that you enjoyed the process. Funny what we find out about ourselves through a simple but sustained process. I'm going to open up the knit a year site to the public in the next few weeks so your readers and others can have a look and see what other knit a year knitters have been up to and join in also. For now if you want to join e mail bethbarlow@bethbarlow.com and I can send you an invite.